The Agulhas Retroflection transfers heat, salt and vorticity from the Indian Ocean to the South Atlantic. The transfer is accomplished by discrete meso-scale features and by the advection of a water column of mixed Atlantic and Indian Ocean origins. 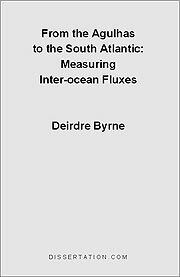 The objectives of this thesis are to measure the strength of the Agulhas-South Atlantic (ASA) exchange and to develop a generalized method for the measurement of mass and thermohaline fluxes. First, ASA mass and energy fluxes are estimated by using sea surface height (SSH) anomalies from satellite altimetry to monitor Agulhas eddies, a significant component of ASA transport. ~20 eddies are tracked from SSH during 1986 - 1989. Six eddies/year are observed entering the South Atlantic; when combined with information from hydrography this suggests minimum annual ASA mass and energy fluxes of O(5x10^6) m^3/s and O(10^17) J. Next, the accuracy of altimetric tide models, critical to measurements of ASA fluxes using altimetry, is evaluated in the Agulhas region by a comparison with in situ bottom pressure (BP). The CSR 3.0 model accounts for 98.5% - 99.4% of the variance in bottom pressure at four locations, with maximum discrepancies between model and in situ tides reaching 6.5 cm. In Enhanced Thermohaline Transport Analysis (ETTA), developed herein, vertically averaged thermohaline transport coefficients are parameterized as functions of SSH and acoustic travel time (tau). These quantities, which can be directly measured, are then used as proxies to determine mass and thermohaline fluxes from time-series of altimetric SSH and tau from inverted echo sounder moorings. Using ETTA, the 1992 - 1993 baroclinic-barotropic ASA fluxes through a moored array at 30S (2E - 17E) are estimated at O(14.5x10^6) m^3/s, O(15x10^20) J and O(83x10^12) kg salt per annum. Meso-scale eddies accomplish at least 18% of the transport. Lastly, ETTA is combined with the Gravest Empirical Mode (GEM) technique to create continuous parameterizations of temperature and salinity fields with pressure, tau and SSH. Thus tau and SSH become proxies for vertically resolved thermohaline profiles. With data from the Caribbean region, GEM-ETTA is shown to have the potential to resolve inter-ocean mass and thermohaline fluxes with time and depth.